The story of how Sharprint came to be what it is today is truly a Cinderella story. From the basement to a 40K square-foot warehouse. Read more about how Sharprint came to be. Proud to serve the best in business, Sharprint works with all types of industries. Small or large business - there is no limit. We put a focus on learning about new products and practices to lessen our footprint on the universe. Read more about how Sharprint is moving in a greener direction. Sharprint is a proud sponsor and supporter of the Environment Xchange Chicago - consisting of artists, environmental organizations, activists, and companies. Learn more about Environment Xchange Chicago. Contact a Sharprint representative to learn more about our services and offerings. Screen Printing, Embroidery, Digital Printing & more. Click here to contact Sharprint today. Looking for an opportunity to put your creativity and love of screen print and/or embroidery to use in an amazing city? Click here to learn more about Sharprint career opportunities. 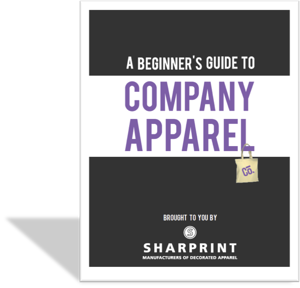 Learn about some of the most frequently asked questions Sharprint representatives receive. Click here to read our most FAQs. Meet the Sharprinters! Professionals of "All Things Apparel". A diversified team of individuals who work with the client always top-of-mind.